Johann Georg Lickl was born 1769 in Korneuburg in Lower Austria. In his childhood he received a training as a church choir boy; he played the organ and and a number of stringed instruments. He studied the art of composition under the Albrechtsbergers and Joseph Haydn. He revered Mozart, so it is no wonder that he made for example own copies of Mozart's masses to include them in his repertoire from 1808 right up until his death. It is known that he made a copy of Mozart's Requiem in 1830 precisely, the same year as Lickl composed his Requiem in C Minor. He was a great composer of church music. A part of his works cover at least 30 masses, 50 graduals, 30 offertories, 5 requiems, and several hyms and vespers. 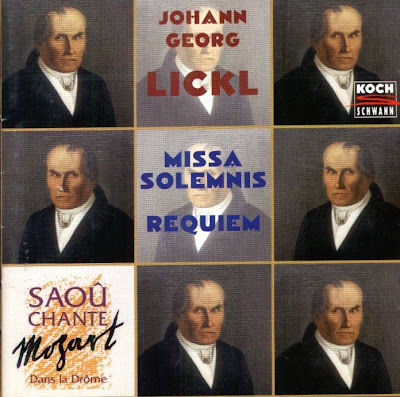 Lickl's music is rooted in the classical traditions of Austrian and South German church music. The shape and movement of his works have a beautiful colouring and a variation of tonality. The Compact Disc was released by Koch Schwann, 1995, (DDD). 3-1296-2.